Series PR01 linear-rotary motors can be used to implement any combination of linear and rotary motions. The compact housing contains both an electromagnetic linear drive and a rotary direct drive, each controlled by a servo drive. This means that the upper-level controller can implement highly dynamic linear-rotary motion sequences that can be programmed to be either synchronous or completely independent of each other. Depending on the requirements, the user can select among various sizes that generate a peak torque ranging from 1.5 to 8.9 Nm. Stroke lengths of up to 300 mm ensure sufficient flexibility in concrete applications. In addition to the standard version, the product family extends to include variants with gearboxes, hollow shafts, and stainless steel components. As an innovative design element, the linear-rotary motors can be used to perform complex tasks, such as threading in, closure, transferring, stacking, aligning, and many others with just a single component. 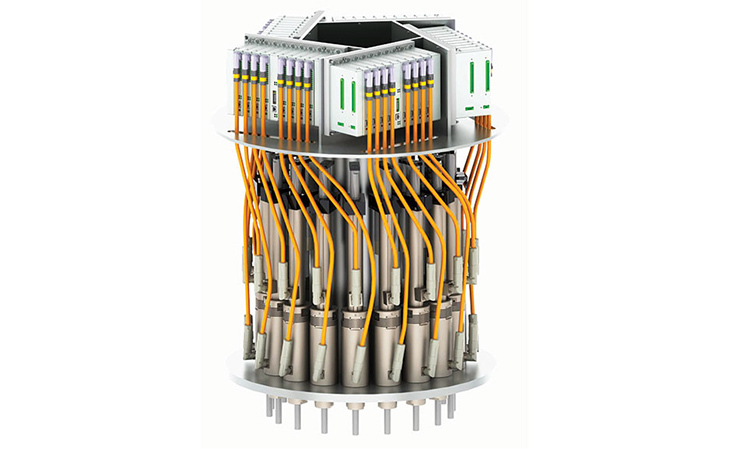 Carousel multi-axis closure systems, in particular, can be made compact and effective with LinMot linear-rotary motors. With this motor technology, the linear and rotary motions can be decoupled from the carousel motion for the first time. Any combination of linear and rotary motions can now be implemented. Motion profiles, speeds, turns, and press forces or tightening torques can be specified arbitrarily and independently of one another. During process monitoring, the cap position at the end of the closure process can be read in order to detect misaligned seating. These innovative multi-axis closure systems allow uncomplicated product changes at the click of a mouse. The user receives all critical parameter feedback on a continuous basis, so that the amount of downtime due to faults is significantly reduced. In comparison with mechanical closure systems, the LinMot solution with linear-rotary motors requires up to 60% less time for a closure process. The standard version of the linear-rotary motor provides the user with a wide variety of available stroke lengths, press forces, and torques. The linear-rotary motor with gearbox allows precise, dynamic positioning even for loads with high moment of inertia. Picking and placing loads outside of the axis of rotation is the classical application for this type of motor. Dynamic and freely programmable motions of small dial tables with simultaneous rotary and vertical travel can also be implemented very easily by means of this new design element. The hollow shaft has a central pass-through opening in its longitudinal axis. This makes it possible to expand the range of application of the linear-rotary motor. Compressed air, vacuum, or other media can be passed through the motor. In addition to the standard linear-rotary motors, the PR01-84 series includes chromium steel variants. The front flange and the rotary axis are made of chromium steel. The rotary axis is sealed against the stator. This means that the linear-rotary technology can also be used optimally in the food and chemical industries.